Pain Physicians NY (Brooklyn, Queens, Manhattan, Bronx NYC) is one of the first practices in New York to offer Platelet Rich Plasma (PRP) Injections for patients suffering with knee pain as well as groundbreaking Stem Cell Therapy for Knees. Our facility equipped with the most advanced, cutting edge equipment to treat pain. Pain Management Brooklyn NYC offers many non – invasive pain relief options, including physical therapy or pain relief injections. Injuries – depending from their severity can affect the ligaments, tendons, knee bursae, cartilages and bones of the knee joint. 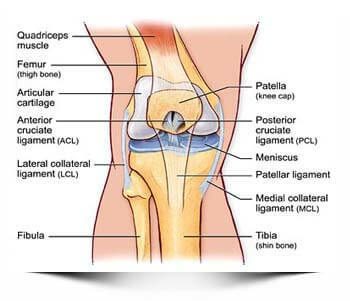 The most common knee injuries are: torn meniscus, knee bursitis, patellar tendinitis, injuries of the anterior cruciate ligament and fractures. Knee Arthritis – different types of arthritis affect the knee joint as well as any other joint in the body. Some of the arthritis types that affect the knee and cause pain include: rheumatoid arthritis, osteoarthritis, septic arthritis, gout, pseudo – gout, etc. Mechanical problems – like dislocated knee cap, iliotibial band syndrome or even hip pain or foot pain can also cause knee pain. Excess weight – obesity and the extra pounds increase the stress on the knee joints, making them more vulnerable and prompt to various medical conditions. Weak muscles – offer less support for the knees, making them more vulnerable and more likely to get easily injured. Physical examination of the affected knee – will help your doctor determine any swelling, tenderness, bruising, warmth or pain. He/she will also check the motion range of the knee joint. Treatment of the knee pain always depends from its cause. Pain killers are often prescribed in order to control and relieve the pain, regardless of its cause. Physical therapy is often necessary in order to strengthen the muscles that support the knee joint. Corticosteroid injections into the knee help reduce the signs and symptoms of the underlying condition due to the reduction of the knee inflammation and swelling. Platelet rich plasma injections tend to promote healing by reducing the inflammation of the affected knee. If you experience chronic knee pain and haven’t found lasting relief through more conventional knee pain treatments, medical marijuana treatment offered by our doctors may be right for you. Call medical marijuana doctor Boleslav Kosharskyy MD of Pain Physicians NY with locations in Brooklyn, Queens, Manhattan and Bronx NYC to help you determine if medical marijuana treatment is right for your knee pain.